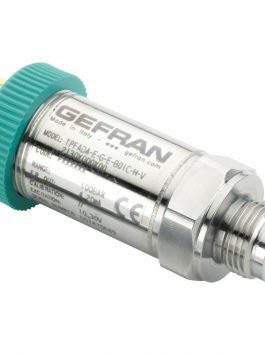 Gefran presents its new TPFAS Series, a fluid-free pressure transmitter with miniature flush diaphragm and measurement ranges from 0-25 bar to 0-600 bar. A flush diaphragm is needed to measure the pressure of high-viscosity and abrasive fluids, because a normal transmitter with traditional retracted diaphragm and threading with through-hole would clog immediately and stop working. With bonded strain gauge on stainless steel technology and a thick, fluid-free stainless steel diaphragm, the TPFAS Series is very robust and resistant, suitable for measuring the pressure of high-viscosity and abrasive fluids such as resin, silicone, polyurethane, glue, rubber, cement, concrete, pastes, mixes, etc.). In addition to its robustness, the TPFAS’s great advantage is its miniature diaphragm, available in two versions (Ø10.9 mm with G ¼” and Ø8.6 mm with M10x1 threaded connection), making it easy to install even in tight spaces. The Ø8.6 mm diaphragm with M10x1 threaded connection is the smallest of its kind on the market, making this product unique! The TPFAS series is also available with the Digital Autozero option, a very useful function activated with a magnetic pen. This function makes the product extremely versatile and efficient, ideal for all industrial applications on mix/meter/dispense machines for resin and polyurethane, glue and adhesive machines, rubber processing machines, cement and concrete mixer pumps, etc.